The NLG Tech Summit for 2018 set out to be ‘an innovation forum with and for youth and adolescents impacted by the crises in Syria and Iraq, to highlight how technology can support education, employment, participation and representation’. Help us learn English so that young people have access to the internet for courses we can use. I would feel honoured to register in a public university, but we do not earn enough. Now I am 29, too old for a grant. So I would appreciate a practical solution. We will lose a generation now, and we will face a bigger disaster, of Syrian uneducated men. Employers need skilled staff, but business owners do not even speak to us. We are very skilled. I am a graphic designer but have no employment to use those skills. One employer had 32 jobs but no connection to the young people who need them. He uses family and friends because there is nowhere to train young people, or link to them. What is your priority? Education. Education, education. Without that how can we rebuild Syria when we go back? PluralSight with UNICEF work to reduce the gap in digital skills development, bringing young people into designing robotics, giving them access to the market, connecting youth with digital and online jobs, and incubation. 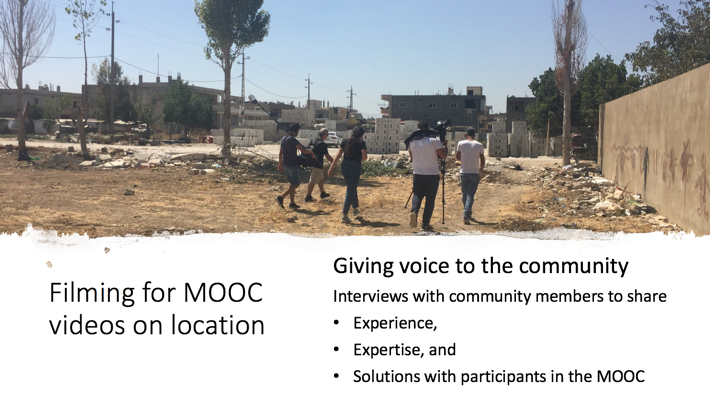 Kiron, through UNHCR, overcomes barriers of costs and legalities in Lebanon and Jordan through MOOC providers and online tutorials, with 250 module completions leading to 75 transfers to partner universities. We developed an e-learning program for Syrians in the construction sector, designed to target 1000 people to help them understand labour rights, conditions and labour rights security. So tech is helping us to promote labour rights. We have Syrian craft products to export to Saudi Arabia and EU to support the Syrian community. A Syrian restaurant here and in Doha, is supplied with these customised products. One man got approval to migrate to USA but said: “I do not want to go now, as I will have to give up my traditional industry there. It is impossible to get the right materials. If I move from Jordan I will lose my business”. Tech is the main key for the entrepreneurs to grow. People in Gaza may be trying to get the basics, but we also want to be more open to the world. So even if they cannot go out of Gaza, this can be the way to help them solve this. So now we can use tech to practice those things. Open your laptop and you are open to the world. Everyone at this Tech Summit about education technologies understood the importance of scaling up the educational interventions, and that only digital technology could help them reach the 100,000s still being neglected. So, what does our ‘Future Education’ project at the RELIEF Centre, at University College London, contribute to these powerful initiatives? We contribute in three ways, I think: by (1) scaling up, (2) harnessing the energy of the teaching community, and (3) designing edtech for active learning. 1. We are co-designing a series of open online courses, with local teachers and NGOs. A MOOC (a Massive Open Online Course on the Edraak platform) can reach anyone with online access. It complements local face-to-face groups of 10s and 100s with online access in a blended learning solution that could reach 100,000s. Its resources, activities and forums could link to all these great projects. 2. We focus on the teaching community, and adult professionals, because they know their local contexts, and have professional skills and experience. From an online collaborative community, they can pass on to their local groups the new techniques they learn, testing and sharing their innovations. Too many EdTech solutions bypass the teachers and talented adults whose energy and experience we need. A MOOC brings them together. 3. EdTech solutions tend to rely on access to resources, but knowledge does not develop by watching videos alone. EdTech can provide active ways of learning – through forum debates, digital tools and games, shared digital making, etc. We will demonstrate how active digital learning can be used in all curriculum areas, not just in the context of learning digital skills. This great conference had a real sense of pent-up energy about to burst, through the outlets being fashioned by all these innovative projects and initiatives, to make a new kind of impact, and release those young minds to achieve their full potential. What a huge responsibility we have to make that a reality.